Easy and fun to make, this popular drawstring bag is great for beginners! 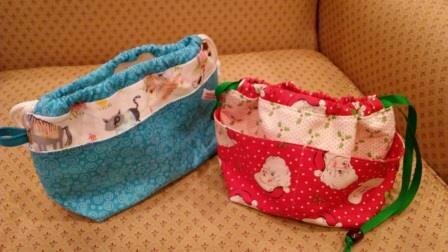 The bag is fully lined and even reversible And there?s an option of two sizes (approx. 4.5''x4''x4'' - wxhxd) and a larger one (approx. 6.5''x5.5''x5'' - wxhxd). Class requires the purchase of a downloaded pattern (PDF) available on the Craftsy website. Go to craftsy.com website. At top, select, "Quilts" and then select "Patterns?. Search for "weebraw bag". When icon for weebraw bag by Zuckerkuss $7.00 appears, select icon and follow directions to purchase. Print out the pattern for class.